There were so many influences here, I’ve rather lost track of them all. Kath started me off with her crystallised violets. It all came flooding back, how I used to crystallise primroses every Easter when I was young. I haven’t done it for many years, but with Easter fast approaching, some holiday, a bit of nostalgia and with enthusiasm renewed, I wanted to try these again. Then I saw the recipe for Paul A Young’s Simnel Brownies and I knew I would be making those in the not too distant future. But, having set my mind on using flowers, brownies didn’t seem quite the thing. They would, in fact, have been an ideal entry for the April We Should Cocoa, but I already had the Battenberg in mind for that. However, the simnel idea stuck – hummm, cupcakes would make a good show for crystallised flowers. I could add marzipan in the middle and maybe use some raisins. OK, what to soak the raisins in? Well, that was a no brainer, with the almond marzipan theme, it had to be amaretto. I then saw Carl’s lovely hidden hearts, which made me think, rather than just adding chunks of marzipan, I could roll it out and use a smallish cutter to fit the cupcakes exactly. Dan Lepard also played his part, by piping crosses onto some of his Easter cupcakes. Peggy of Fake It ‘Til You Make It very kindly sent me a wadge of disposable piping bags after I broke the reusable one I got for Christmas on the very first attempt – making macaroons. So thanks to Peggy, I thought I’d try Dan’s crosses. Went to the local art shop to buy myself a paintbrush. Beat a duck egg white (leftover from making marzipan) briefly in a small bowl. Put a couple of spoonfuls of caster sugar in another small bowl. Gathered some primroses, a violet and a pansy from my garden (not many violets or pansy’s and didn’t want to denude the plants) – it’s important that if using flowers they are clean, ie have not been sprayed or been where dogs or motorised vehicles could have polluted them. Held the flowers by the stem and painted the tops and undersides with egg white. As soon as flower had been painted, dipped it in the sugar and sprinkled more over as needed with a teaspoon. Shook off the access then laid them down on a tray lined with baking paper to dry, cutting off the stem as I did so. Left to dry over night, then put into an airtight tin until ready to use. Soaked 60g raisins in 2 tbsp amaretto overnight. Creamed 125g unsalted butter with 125g molasses sugar until pale and fluffy (the weather being so warm, I had no problems with hard butter for a change). Sieved in 125g flour (1/2 wholemeal spelt, 1/2 white), 1 heaped tbsp cocoa, a pinch of Himalayan pink salt and 1 tsp baking powder. Stirred in about 1/3 of the melted chocolate and 1 tbsp Greek yogurt (0% fat). Mixed in the raisins and ameretto. Spooned half the mixture into 12 cupcake cases. Rolled out about 150g marzipan and used a 5cm circular cutter to stamp out rounds. Placed circles over the cupcake mixture, then covered with the remaining mixture. Baked at 180C for 17 minutes until risen and firm to the touch. Added about 50g unsalted butter to the remaining melted chocolate. Beat in 50g icing sugar until all smooth and incorporated. Stirred in 2 tbsp amaretto. Attempted to pipe crosses onto the cakes, but only managed one before my nozzle fell out of the bag. Gave up on that idea and spread on with a palate knife. Placed a crystallised flower in the top of each cake. These featured at another Easter tea eaten in a Cornish garden as well as on the Easter platters. The primroses were delicious, they had a very subtle but distinctive floral taste as well as a rather unexpected crunch. As a flavour combination, these ingredients worked really well together. The amaretto just enhanced the marzipan flavour and the alcohol soaked raisins added another level of richness with the chocolate bringing it all together very nicely. The cakes were moist and truffle like and rather filling – nothing wrong with that of course. The chocolate topping gave yet another dimension and unusually for me, was just the right consistency. The piping I have yet to master. I am entering these for Julia Parsons annual Easter Cake Bake – a mouth watering feast for the eye, if ever there was one. You can see all the entries there from previous years, although this year’s round up has yet to be posted. In fact you still have three days left to enter if you feel so inspired. Chocolate Amaretto Easter Cupcakes. PIN IT. These sound wonderful – a great combination of flavours! Cupcakes look so pretty with the flowers! OMG amaretto and chocolate plus flowers, gorgeous! My mum has a thing about eating flowers and since I was quite young was always dotting her salads with nasturtiums and other assorted edible flowers. Crystalised flowers are so pretty. Great job there. Cupcake looks so pretty and delightful..
Suelle – thank you. I’m pleased to say they did get a few accolades. Joanna – it’s really not that difficult. As you know, I’m not into faffy, but I would quite happily do the flowers again. Xinmei – the amaretto soaked raisins were rather scrummy and these weren’t nearly as complicated to make as the Battenberg. Janice – thank you. If there are any to be had, we also use flowers on our salads – it makes them so pretty. MCB – thank you, I don’t always manage pretty, so it’s particularly good when I do. Mostly About Choc – Thank you for the compliment, but I’m sure that’s not in the least bit true. The flowers aren’t at all difficult to do, just take a bit of time. Johannaa – I’m sure you would like them, they were rather good, though I say so myself :-S As for the piping, I only managed the one! Chele – that is a complement indeed coming from you. Thank you. Gloria – thank you, you’re very kind. Sooo pretty! I love the flowers. Amaretto soaked raisins? Yes please. CityHippy – thank you. Both flowers and raisins are a winner. Thanks for putting how to crystalize flowers. Ananda – hope you give these a try – the flowers are well worth it. Mostly About Choc – OK point taken, but I’ve still seen some nice looking baking on your blog. James B – you’re welcome. Are you going to give them a try? these sound so yummy. I will try them soon. These look so beautiful. I bet they taste divine. That’s a work of art! Beautiful and looks delicious too. They look totally delish. I would love to have a try at these. I would love to be able to bake good but for some reason nothing ever turns out as it is meant to. Will give it a good go though. Thanks. Love these with the little flowers – look great! 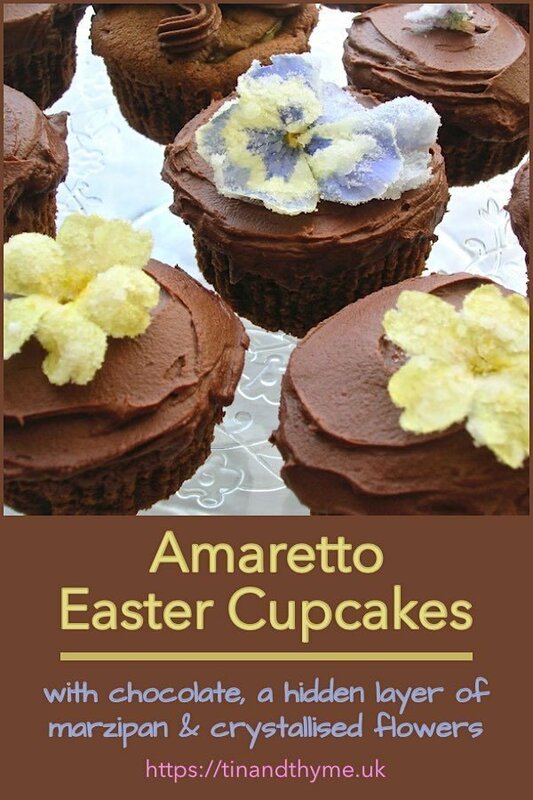 Love amaretto, must try these next Easter, sure they will be delicious! How creative! They look almost too good to eat.